Key Performance Indicators (KPIs) are business metric that help to figure out the progress of an enterprise in meeting its business goals. KPI Value: A physical measure or a calculated measure. KPI Goal: Defines the target for the measure. KPI Status: Evaluates the current status of the value compared to the goal. KPI Trend: Evaluate the current trend of the value compared to the goal. The “KpiElements” class in OLAP Base library holds the KPI name and when its object is added to an OlapReport, you can view the resultant information in PivotClient. 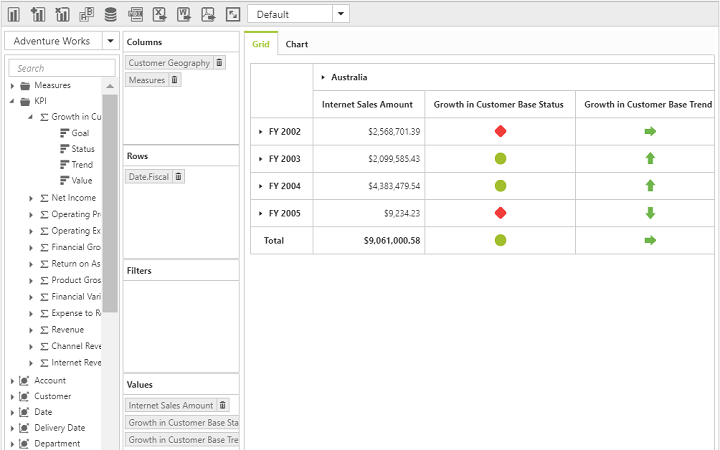 To enable KPI option set the property EnableKPI to true.